Khadidja Aliouane, Belkacem Benmerad, Narimène Rahahlia-Taïeb, Hamza Kheri, Achoura Guehria-Laïdoudi*, Slimane Dahaoui, Claude Lecomte. Abstract: A new Ce(III)-malonate, growth by hetero-nuclearsynthesis, is investigated structurally at 100K. In this oxobridgedmaterial, the bi-anion does not allow the formation ofany synthons, but various bridges form connections displayingtypical sub-features. Cross-linked edge-shared CeO9 and CeO7(H2O)3 polyhedrons built up 3D packing accommodating twowater molecules embedded in extensive H-bonds. Stable at 25°C, it undergoes concomitant dehydration and decarboxylationsequences. By comparison, Ca(II)-hydrogenmalonate and acidicBa-malonate are also oxo-bridged polymers, but obtained differentlyand are much more stable. The former shows face-sharingbinuclear units, and synthons. The protonated ligands present inthe two alkaline-earth materials give peculiar decompositionprocess. 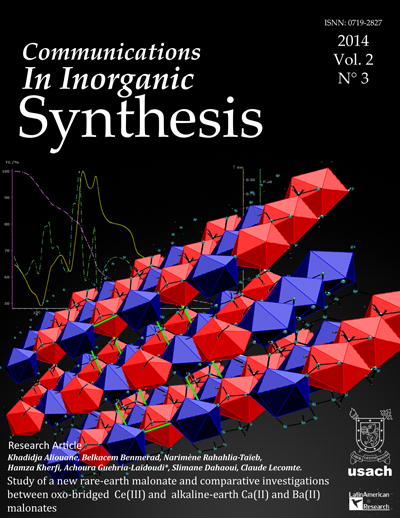 Supporting information: TGA/ DTA/ DTTA curves of Cabasedcompound, TGA/ DTA/ DTTA curves of Ba-based compound,Coordination polyhedrons and fragment of 3D frameworkin Ce-malonate, Cross-linked layers in Ce-malonate, TheC(6) synthons in Ca-based compound, The bi-polyhedron stackingin Ca-based compound, Crystal data, collection proceduresand refinement for Ce-malonate, Selected geometric parametersin Ce coordination spheres, Hydrogen-bond geometry in Cemalonate,XRPD(X-ray powder diffraction) patterns of someintermediate and final TG products.